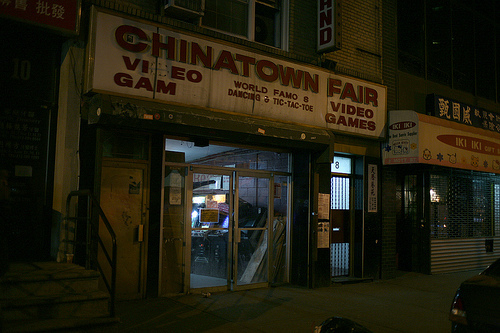 Arcade: The Last Night at Chinatown Fair by Kurt Vincent is a documentary about the closure of New York City’s last video game arcade, the Chinatown Fair, which was a haven for a thriving and diverse community of avid gamers. The film is still in production, with a planned release in early 2012. Vincent is raising funds on Kickstarter to finance the completion of the project. ARCADE: THE LAST NIGHT AT CHINATOWN FAIR is a feature documentary about New York’s famed arcade Chinatown Fair. After nearly half a century of being open Chinatown Fair suddenly closed after receiving an unexpected eviction notice, echoing the fate of many small businesses in New York City. The arcade is yet another NYC landmark to be lost. Filmed during Chinatown Fair’s last moments, the movie captures the diverse community that called the arcade home. Interviews with the arcade regulars reveal a history and subculture full of surprising stories and amazing characters.